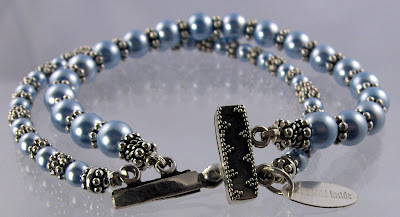 I got an itch to do something a little more "Springy" the other day and pulled out a bunch of pale blue Swarovski pearls, some little Bali granulated spacer beads and an exquisite, hand crafted, two-strand Bali slide clasp. I bought several of these clasps, in a couple different designs, a while back and found them while hunting up any two-strand clasp I might have buried in my supply drawers. Each one of those little silver dots in the design is added .. one little silver dot at a time. A little bit of silver is torched until it balls up, then it's quickly "picked" up with a soldering pick and put in place. The process is called granulation. The same procedure is used to make the little "flower" spacer beads between the pearls. When you consider how long it must take to make one of these little gems, it's a wonder they don't cost a lot more than they do. 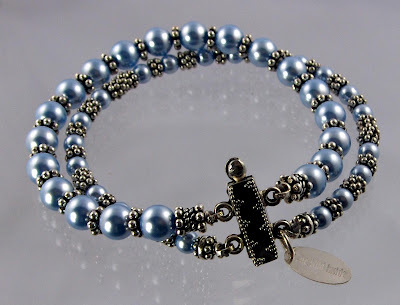 At the moment, this bracelet is filed on my Zip Drive as Bali n Blue .. I may change the name if another more suitable name comes to me. It's a pretty little thing .. the color of a little blue bell maybe. As there is still snow on the ground from a recent snow fall, it'll be a while before we see blue bells. And we awoke to frozen pipes in our master bath this morning .. Spring in date only.